The handbill of events for the next Art Night on Thursday, September 24 is out. Mark your calendars. KHS fine-art photography will be featured at the East Bay Chamber of Commerce in Warren (16 Cutler St. #102) from 5:30 to 9:00 pm. Hope you can stop by to see my photos and say, "Hello." The East Bay is teeming with talented designers. Take Dawn Oliveira. I discovered her and Oliveira Textiles at an ART Night Bristol and Warren tour when I first moved to the area a few years ago. Ever since, I've been plotting how to incorporate some of her beautiful, sustainably produced textiles in a KHS architecture and design project or in our own home. Well, the wait is over. Dawn has printed some of her stunning patterns on hemp/organic cotton for us to use at our place. I'm thrilled that a couple of her abstract "floral-esque" patterns, which are mostly hand-printed with water-based dyes at local mills, will grace a smattering of our furniture. I've been encouraging a client to consider one of her sea-inspired themes for his built-in bench, too. Here's a peek at the freshly printed patterns I selected. That's "Madeira Vine – shale sand" in the foreground and "New Madeira Vine – citron/brown " in the background. So lovely. Contact Dawn for an appointment to see her designs in person at her studio. Soon you'll be plotting your own project with her textiles. Before Hurricane/Super Storm Sandy hit, I had the pleasure of attending several studio tours in my new hometown of Warren, RI. Twice, I dropped in on the studio of Pat Warwick who creates one-of-a-kind ceramic surfaces. If you're a New Englander, you may recognize Pat's embossed ceramic tiles which depict elegant sea creatures and insects set in simple white tiles. I did. 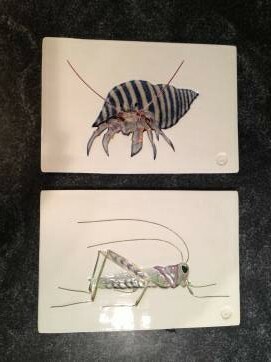 A couple of years ago my sister-in-law picked up a fish tile by Pat in Woods Hole as a gift for us. Then, this fall we received the tiles shown here (on our kitchen counter) as a gift from our art-savvy realtor, Paula Silva. Just lovely. So I jumped at the chance to drop in on Pat's studio during the recent Warren Walkabout and ART Night Bristol and Warren. The great thing about a studio tour is it shares much of the appeal of a house or garden tour. It offers a rare opportunity to glimpse how someone has shaped their environment to suit, reflect, and enhance who they are, who they want to become, and how they choose to interact with the greater world. Of course, the added advantage of the studio tour is that a piece of the artist's unique world, their work, is generally available for purchase. I'm already scheming how to incorporate some of Pat's work into my own home, and how her work might make for a nice accent as a backsplash in a client's powder room. Check out open studios in your area for insight into your local artists and their work. This weekend consider attending open studios at Holliston Mill, in Roslindale, and Waltham Mills.